The greatest enemy of the UFO community is…the UFO community. Such has been said by many, most lately by Scott Ramsey, of prominence in The Aztec Incident. The useful debate in “The UFO Chronicles” including contributions by Alejandro Rojas, Kevin Randle, Stanton Friedman, Barry Greenwood et al., perhaps misses a major point. First of all, Friedman did the most thorough forensic examination and research into the photographs of the MJ-12 documents, just as he studied the Special Operations Manual SOM1-01. The disinformation question is not whether a particular document is genuine, but rather why these documents came into public view in the first place. Genuine documents are very valuable in promoting disinformation. Because I teach propaganda, I emphasize that disinformation is a category of the propaganda mission with a specific purpose. Disinformation is designed to create confusion and to reduce certainty. The original discovery of the MJ-12 documents as a roll of undeveloped black and white film, now connected to AFOSI agent Richard Doty, and received by William Moore and Jaime Shandera must be studied in light of the motives of the government. There was a need to create public uncertainty after Friedman first interviewed Jesse Marcel and the Roswell Incident overcame decades of government suppression to become a reality firmly lodged in modern public awareness. Good disinformation requires information credibility and source deniability. So why fabricate information that will easily be disproved over time? The ludicrous crash dummy story about Roswell is one of those, and Donald Menzel’s books on flying saucers, such as Flying Saucers—Myth—Truth—History, are another. The MJ-12 documents, however, and the special operations manual on the other hand “have legs,” in that they continue to persuade students of flying saucer reality and to spark debate. If the MJ-12 documents or SOM1–1 (the latter proved by Friedman not to have been set in a computer type font) are fake, they required highly placed sources to create them and the deep pocket resources available only to the Intelligence community in order to make the documents credible. It is very expensive to set type and print a manual identical to the military manuals of the day printed by the U.S. Government’s printing office. Disinformation goals could be achieved by supplying carefully chosen original documents and photos of a real secret government publication. Without a pre-emptive strike, eventually MJ-12, by whatever name it was known, would have surfaced, so the back door release of selected documents could muddy the flying saucer water permanently. Some would say that Doty was a whistleblower trying to alert the public to the reality of flying saucer reality, but experience leads us to believe that he was just doing his job for AFOSI. After all, Phillip Klass, Karl Pflock, Joe Nickell, James McGaha, Michael Shermer, and a coterie of others, have or had a military or intelligence background. Some of their publications are likely, but not proved, to be supported by government funds. Thus, the disinformation function is well staffed and well supported in the United States. As for AFOSI, The Aztec Incident: Recovery at Hart Canyon (see the entire interrogation of AFOSI with Denver radio station advertising executive George Koehler) shows how seriously the Air Force was in tracking down the leaks of the Aztec flying disc recovery. Even today’s current tracking of Ebola contagion is not as thorough as the Air Force was in 1949–1950 in covering the tracks leading from Aztec. However the disinformation masterpiece was in discrediting Silas Newton and Leo GeBauer in an irrelevant business deal gone bad, and using a Denver courtroom to destroy the credibility of the first published story of a flying saucer recovery. The MJ-12 documents were not released to the New York Times, as would befit a “Three Days of the Condor” type mission, starring Robert Redford. After all, that would never promulgate such documents, and the Associated Press by policy will not put UFO stories on the wire in most cases. Thus, the release of documents through an ambivalent source was far more successful. The real and the false are carefully blended to reduce certainty. This may be harmless, but in the Paul Bennewitz case, it proved devastating to a man’s life. In this latter case, Richard Doty may have been the agent who helped destroy Bennewitz’s well being, all through AFOSI disinformation. The argument over MJ-12 will never be concluded, and a large segment of those who study flying saucers will continue to accept the scholarship of Stanton Friedman whose scholarship creates high confidence in the reality of the documents. Most of the naysayers fall back on ad hominem attacks that are the last resort of those who have lost the factual argument. The character or credibility of Richard Doty, William Moore, Jaime Shandera is of minor importance. The essential reality of the documents, though they are only photographs of documents, must be the only focus of the research, and Stanton Friedman is the only researcher who thoroughly and minutely examined all of the data available in those black and white images. 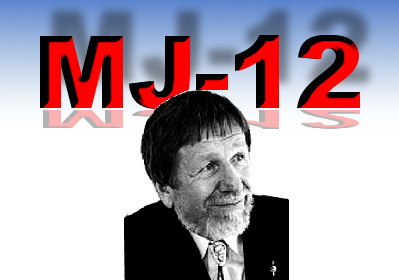 Both the MJ-12 papers and SOM1–1 remain today as credible evidence—and the arguments against them will be advanced as well, even on this even-handed forum. The UFO community, for its part, will continue to ravage its own members and eat its young. Visit Frank's web-site . . .